Duke is ranked as one of the leading medical schools in the United States. 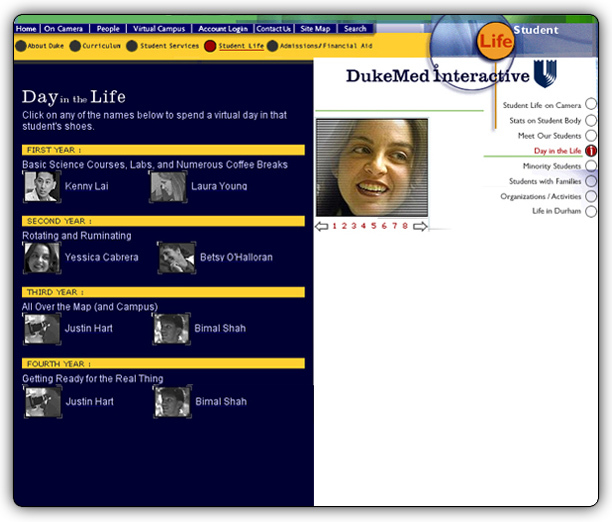 DukeMed Interactive was produced to help provide potential medical students a clear picture of the DukeMed world along with resourceful information about the statistics, the people, the city, and the University in general. Leading the efforts, Duke Creative, a department of Duke Medical Center, approached IONA for the design and development of the project. 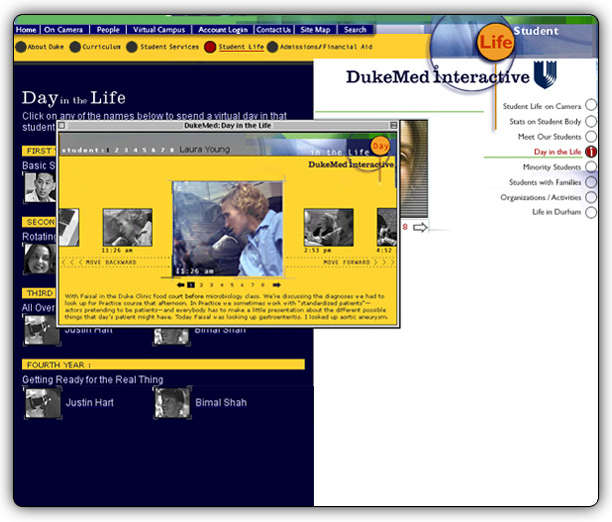 Using technology such as Flash, streaming video, and DHTML, DukeMed Interactive provides Duke Medical School a visually and technically complex web marketing tool that surpasses its competitors. Along with the design and development of this recruitment website, IONA provided consultation, design, and integration of MCAT scores and the Duke Medical School acceptance process. 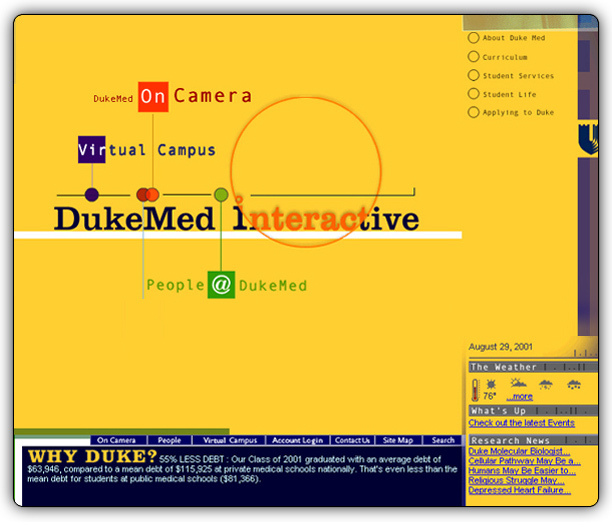 At the time of its launch, DukeInteractive.com was truly a leader of online digital experience like nothing the college recruitment organizations had over seen. With a multitude of online videos showing students about the ‘Day in the Life’ of a student and the direct experience of students going through Match Day, the experience led students to grasp a greater understanding of the Duke experience. DukeInteractive.com won many awards in the internet industry for the digital experience. This project, still today, is a leading example of forward thinking and creative vision of the team members at IONA interactive and its sponsor Duke University Medical Center. With the implementation of a complete creation of a digital experience, the skill set required for the project ranges from art direction, user experience design, web development, photography and video production, media optimization, video streaming, application management, and hosting management.